It is no secret that I’ve always wanted to receive galleys to be reviewed and be compensated with more galleys, but I just lost time for most of last year since I shifted officially into the Anglo-American Literature program in my uni. So, bit by bit, I vow to really get on with this blogging business and continue reviewing, because – I’m still nowhere near receiving galleys as often as I wanted to. Anyway, I recently opened my account on NetGalley, because a friend reminded me that, hey, I also have this dream of receiving galleys and I need to work on it STAT! And, look what a pleasant surprise I found! 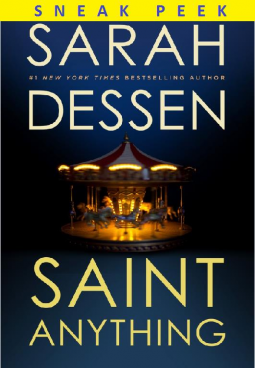 There is a free sneak peek of Sarah Dessen’s Saint Anything, which will be released this coming May! I am beyond excited for this!! As you may, or may not, know, I am a huge Dessen fan. I will read anything this woman writes. And even though The Moon and More didn’t really win my heart, I still believe in Dessen. And the sneak peek really strengthened my love for her! Peyton, Sydney’s charismatic older brother, has always been the star of the family, receiving the lion’s share of their parents’ attention and—lately—concern. When Peyton’s increasingly reckless behavior culminates in an accident, a drunk driving conviction, and a jail sentence, Sydney is cast adrift, searching for her place in the family and the world. When everyone else is so worried about Peyton, is she the only one concerned about the victim of the accident? Enter the Chathams, a warm, chaotic family who run a pizza parlor, play bluegrass on weekends, and pitch in to care for their mother, who has multiple sclerosis. Here Sydney experiences unquestioning acceptance. And here she meets Mac, gentle, watchful, and protective, who makes Sydney feel seen, really seen, for the first time. The sneak peek provided by NetGalley was wonderfully short. Such a tease. But in that very short taste of what’s to come this May, I have full confidence this book is going to rock everyone’s world, and I know this will solidify Sarah Dessen’s writing legacy even more. The thing about Sarah Dessen is that her works pack so much power on being a story about a girl and how she grows into her own person, tempered by unfortunate circumstances, difficult people, and the heady potential of a young love. One may think that such bildungsroman stories are so typical nowadays what’s new, right? Well, Sarah Dessen’s stories strength lies in how realistic they are. They remind readers that everyone’s problems are very real, whether they be complex or simple. And in reality, what young adults face are simple but very difficult problems. You’d think that family problems or losing yourself along the way are very typical, but that’s exactly it. People usually dismiss such encounters as nothing big, nothing significant, that they overlook how trying it is to be in the middle of such adversity. And Saint Anything, if by judging from that snippet, is going to give us exactly the Sarah Dessen that we all loved, with another character we will be friends with. Sydney feels so lost and at the same time, in that few lines that we meet her, she easily captivated our hearts with her. She grew up in a family that could more than provide for her, and her brother as the central character in her life. And in a slow descent into madness, her world is flipped. She volunteers to change her lifestyle to help with her family, her brother goes to jail, and she is just right there, in the precipice of Before and After. It’s a scary place to be in, and full of possibilities – whether good or bad. I am excited to read about Mac though, because we weren’t really given much exposure from him. I really hope he gets to have his own development in the story, as compared to Dessen’s previous book. So, yeah. I am so stoked for this book. Its release is on May, and of course, I’ll be blogging about it! I feel it in my bones that this is going to be a classic Sarah Dessen book. I feel it!! !